It could have been the grand final. Everyone was waiting for the League of Legends semifinals rematch between SK Telecom T1 and the ROX Tigers. The hotly anticipated best of five was between the two best teams in the world, and they share a long history. The ROX Tigers have exceeded SKT in the past, taking the LCK crown in the summer—but they've never managed to defeat SKT directly in a series. This was the ultimate test for the ROX Tigers. The Tigers played to their strengths, going for aggressive compositions and aiming to knock SKT off their feet. SKT, on the other hand, maintained the playstyle that has taken them so far at Worlds. They played a slow, methodical game of League of Legends, choking out ROX and taking every advantage that they could. Let’s revisit the series: it’s one that’ll be treasured as a part of League history for years to come. This game could be used as a textbook example of high level League of Legends. The ROX Tigers went for a comp that would allow for early aggression: Caitlyn, Elise, Viktor, Karma, and Poppy. SKT replied with a slow comp that would lock ROX down: Ashe, Olaf, Orianna, Trundle, and Zyra. While ROX tried to gain traction early with ganks, SKT weathered the storm. Faker managed to pull ahead in mid lane, pushing down a tower and gaining a sizable CS difference. ROX fought hard, ROX stole a baron and fought well, but ROX still lost. For a brief moment, SKT—a team known for slowly ramping up over a series—looked more invulnerable than ever. Imagine, for a moment, that you’re enjoying a game of League of Legends when you see the following lineup: Ashe ADC, Miss Fortune support, Karma mid, Rumble top, and Lee Sin jungle. Don’t lie to me, you would absolutely dodge that lineup and curse it as the worst dredges of solo queue. What if I told you that it wasn’t a Bronze IV pleb who was running that comp, but the ROX Tigers. After losing game one, they decided to switch things up, and boy howdy did they go with an unusual composition. They smashed SKT, taking them completely off guard. 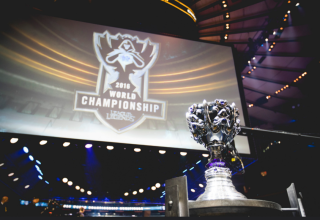 Miss Fortune tore through Zyra’s plants, and ROX pulled ahead with a dramatic lead over SKT. They may not have had a support, but Karma’s team shielding got them through the worst of SKT’s damage, and then the wave of damage from two ADCs kicked in. This game tied the series as ROX shredded the Nexus. In the grim darkness of the future of solo queue, you can expect to see players picking Miss Fortune support. No, they won’t be GorillA. SKT shifted their comp considerably, putting Faker back on Orianna for area control and sticking with the Zyra support for Wolf. Ekko, Olaf, and Caitlyn rounded out the roster, making a meta friendly team. ROX, on the other hand, rolled with nearly the same roster, switching out Karma for Viktor. Once again, ROX was able to pull into the lead. An Ashe arrow to the face, combined with a Miss Fortune ult, demolished SKT’s bot lane. Kuro, an accomplished Viktor player with a 31-7 record heading into the game, was able to stand up to Faker. This was slower than the avalanche of game two as SKT began to find their feeting against the bizarre bot lane, but ROX still took the game. Pray’s arrows kept landing, and the team damage wiped the unlucky target out. By this point, this series was cemented as one of the best in League history. Both teams switched up their comps thanks to a priority Miss Fortune ban from SKT. The teams assembled once again, with SKT having Zilean, Gnar, Jhin, Karma—and most notably, Bengi playing his first professional game on Nidalee as a first pick for SKT. ROX, on the other hand, kept the Ashe and paired her with a Zyra. Olaf took the jungle, Viktor remained mid, and Rumble graced the top lane once again. It was a similar comp that continued to play to their strengths: the Ashe arrows with the ability to blow up whoever got sniped. Bengi and Faker proved why they’re both two time World champions by holding their ground against ROX and managing to pull ahead throughout the game. After remaining two steps ahead of the Tigers, SKT closed out game four and brought us to the finale. In the end, it all came down to game five. Only one team could advance to the finals. ROX had their Miss Fortune banned out once again, and went with a heavy damage comp of Jhin, Zyra, Karma mid, Jayce top, and Elise jungle. SKT, on the other hand, continued to build a relatively safe team: Nami, Orianna, Ashe, Poppy, and Lee Sin—so many ways to control a zone, or push a hostile pack of Tigers off their backs. That comp ended up allowing them to drag the back and forth slugfest out, scaling into the late game. Bengi shone in this game again, despite an early death to Peanut. After 42 agonizing minutes of SKT growing their lead and pushing ROX into a corner, they took the nexus and the series. In some ways, it’s tempting to get down about the finale. The ROX Tigers have been so likable, and this really seemed like their year where they could take the entire tournament. On the other hand, SKT deserve the win and fought hard to advance to the finals. There’s just one last obstacle between them and the final prize: Samsung Galaxy. If SKT's record is any indication, we can start to get excited for yet another SKT Worlds win to end 2016.